Choose from three, Angel Ashes designed, photo frames. Our most popular version, the Original Edition angel pet urn with photo frame, has comforted countless families during their time of loss. 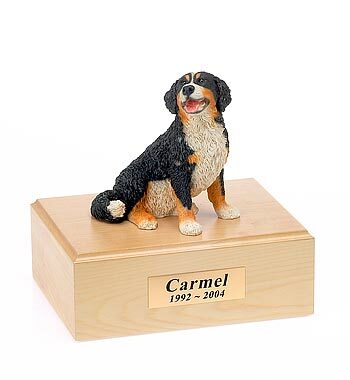 It was created to provide pet owners with a beautiful way to memorialize their loved one. 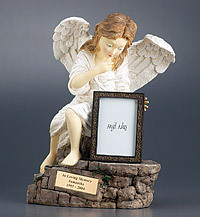 The Original Edition angel was sculpted by a well-respected U.S. artist to be a one of a kind pet memorial. Due to the uniqueness of these pet urns, Angel Ashes was awarded a patent from the U.S. Patent Office in May 2004. Truly a work of art, each angel pet cremation urn is individually handmade with stunning detail. Cast in designer resin, your pet loss memorial angel is offered in four finishes: Bronze Patina, Hand Painted, Marble and Stone. The outstretched hand of the angel offers comfort after pet loss and provides the ideal location for a photo frame. The Small Frame is designed to sit just under the angel's outstretched left hand. It accommodates a photo of 2-1/2" wide x 3" high. The Large Frame and Scalloped Frame provide for a "regular" size photo of 3-1/2" wide x 5" high. Our Original Edition pet cremation urns are approximately 15-3/4" tall, 11-3/4" wide and 7-7/8" deep and will accommodate a pet up to 150 lbs. Your Original Edition is personalized with a solid brass nameplate with an inscription of your choosing. The inscription may be one, two or three lines. We provide a choice of nameplate colors: Gold Bright Brass, Blue Marbleized, Brown Marbleized or Green Marbleized. Visit the Personalization page to view actual nameplate colors and inscription styles. Your pet's bagged cremains are placed in the urn via an access cover on the bottom of the base. This access cover has a hinge and clasp to secure the ashes. Please refer to our FAQ for suggested additional directions on how to place your pet's cremains in your Original Edition pet loss memorial. There are four felt pads to protect the surface where your urn is placed.